I have my attorney hat on again. I found work doing document review through Hire Counsel in Columbia, SC. I couldn't find legal work in Mississippi. You can do document review with admission to the bar in any state. I'm a member of the state bar of California. I lived there for 19 years. Went to law school there and practiced law there for four years. I'm working from 8 am to 8 pm M-F. I take about 45 min to eat lunch and walk around. I can also work weekends when I want to. Tonight I got home (to my extended stay hotel) a little after 8 pm, started doing laundry which I didn't finish until after 10 pm, and then ate dinner. I don't really feel like getting on the computer too much after staring at it for 11 hours at work. I don't know how many posts I'll make while on this schedule. Don't expect too much. However, a lot of things can pass through your mind in the quite concentration of reviewing documents. I might share them here. Being tired doesn't bother me though. It's validating. 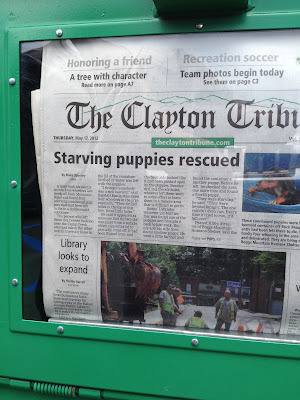 BTW -- The starving puppies have been rescued! Everyone can breath again.